You and your significant other have decided to buy your own home. Congratulations! This is an exciting time!While the process of buying a home may be exciting, it can also be overwhelming. When two people decide to purchase a home together, it’s important to understand that you not only need to consider your own finances and credit profile, but your partner’s finances and goals as well. To get started, here's some things you should consider and do before you even start looking at potential homes. Where would like to live, what type of house would you like to purchase. Are you thinking of a single-family home or a condo? Do you want to build a home or purchase an established property? Having answers to these questions will help you speak to a lender and learn how the type of home you choose may affect loan approval requirements or what options exist if you want to build a home. Here you need to think about and discuss both of your credit scores. Lenders use customers’ credit profiles to help determine their ability to repay a loan. When purchasing a home with your partner, both of your credit scores are considered and in most cases, the lowest middle score between the two of you will be used. If you or your significant other has a very low score, this may not only impact the loan amount you receive but also the interest rate. 3. What debt do you both have? It’s important to have an honest conversation about debt with your partner. A factor that lenders evaluate is your debt-to-income ratio. This varies by mortgage program, but you want to ensure that, if possible, your debt is low and your finances are in order prior to getting preapproved. How much money can you put toward the purchase? Most loan options require some sort of down payment. In many cases lower down payment options require private mortgage insurance (also known as PMI), which will increase your monthly payment. If you can avoid paying PMI, your mortgage will be significantly lower. Purchasing your first home is an exciting time and, for many people, a sign of success. While you may want to rush out and start shopping, be sure to do your financial homework first. Having a conversation with your significant other about the topic beforehand will ensure that you’re both on the same page and set you up to make the most of your future. Our team helps 1sttime home buyers conquer their home ownership goals, so that they feel 100% confident in their investment in a home where they may create memories today while building a strong financial tomorrow. 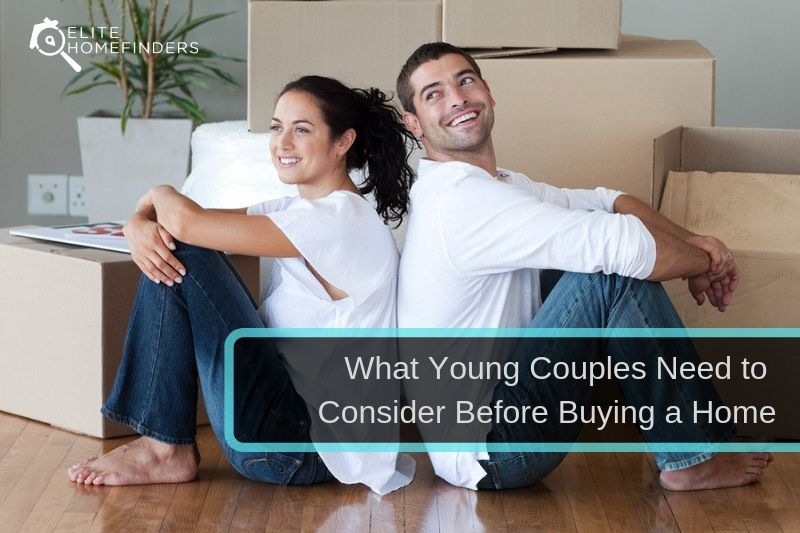 Do you have any questions about buying your home as a couple? If so we’d love to answer, email us at hello@elitehomefinders.comand let’s talk more!